French actor; born in Paris March 21, 1837. He was graduated from the Conservatoire in 1857, winning the first prize for tragedy and the second for comedy. Soon afterward he was engaged at the Théâtre Français, where he made his début in 1859 as Achille in "Duc Job." In 1862 Léon Laya, appreciating the clever comedy work of Worms, engaged him to create the part of Horace in "Loi du Cœur," and his success was so marked that he secured a contract with the Théâtre-Michel, St. Petersburg, where he repeated his French successes. In 1875 he returned to Paris, making his reappearance at the Gymnase as Armand Duval in "La Dame aux Camélias" with great success. 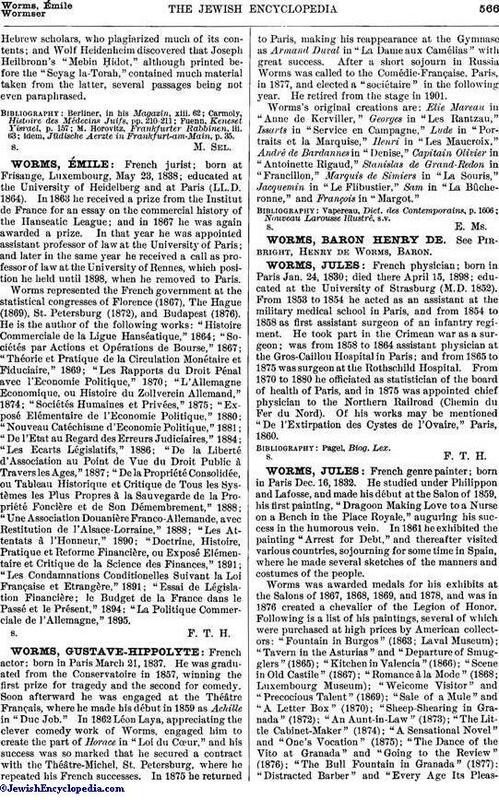 After a short sojourn in Russia Worms was called to the Comédie-Française, Paris, in 1877, and elected a "sociétaire" in the following year. He retired from the stage in 1901. Worms's original creations are: Elie Mareau in "Anne de Kerviller," Georges in "Les Rantzau," Issarts in "Service en Campagne," Lude in "Portraits et la Marquise," Henri in "Les Maucroix," André de Bardannes in Denise," Capitain Olivier in "Antoinette Rigaud," Stanislas de Grand-Redon in "Francillon," Marquis de Simiers in "La Souris," Jacquemin in "Le Flibustier," Sam in "La Bûcheronne," and François in "Margot."